My son and niece (8 and 11 respectively) had made some sugar syrup* for me last week – they are pretty good with the stove these days and eager to see how things are done. 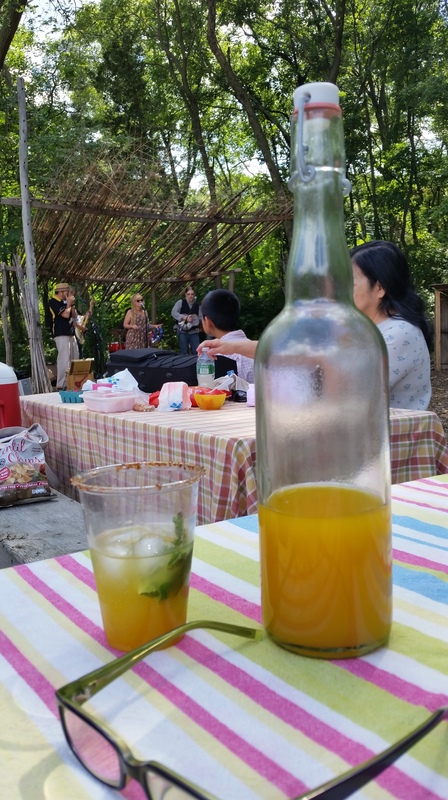 I actually used most of it for adult beverages (mango-chile mojitos and passionfruit mojitos), but in return for their help, I promised I would show them how to make lemonade. In fact, while they were squeezing the lemons, I was taking a shower, then we just measured and mixed and that was it. 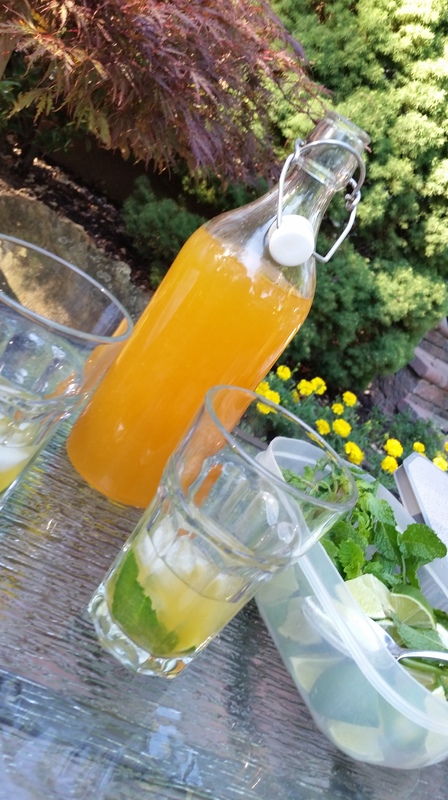 It was extremely tasty and refreshing and very easy (especially for me, because they did all the work) and looked so pretty in a special bottle! We’ll be doing it again very, very soon! So easy, why would you buy? * sugar syrup: 1 Cup sugar, 1 Cup water, heated on the stovetop till clear and liquid, then cooled. Keeps in the fridge for a month. It was another summer Friday in the neighborhood and that called for another festive cocktail. 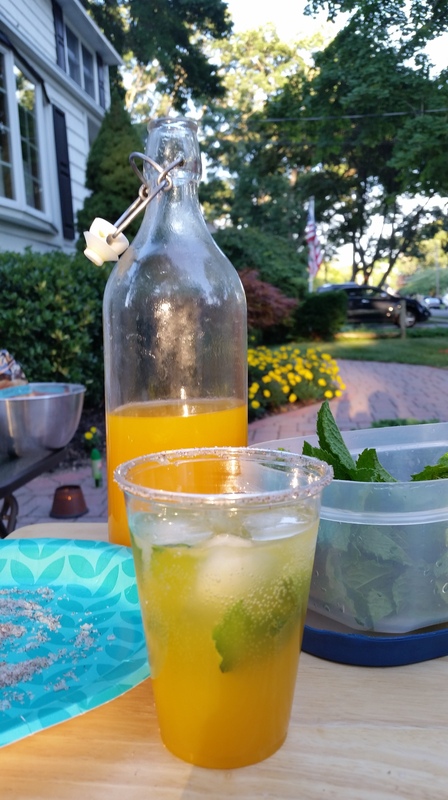 Riding high on the success of last session’s passionfruit mojitos, I decided to make mango mojitos. The drink itself followed much the same construction, but the mango was decidedly sweeter than the passionfruit, so I decided that it needed a spike of heat and salt for proper balance. Ancho chile salt on the rim provided just the right touch.Your lips get hot, your tongue gets salty, then the potent sweetness of the mango and rum drenches your mouth in happiness! I made enough to take to a Spuyten Duyvil concert at the farm two days later. Once again, big hit (except for the bit about the plastic cups…it is not good form to use one-time use cups in our world, but sometimes it happens; mea culpa)! Mix rum, juice and syrup together and place in a container until you are ready to use. Mix salt and ancho chile powder thoroughly and pour onto a small plate. Rub the rim of your empty glass with lime then twirl the rim in the salt until coated. 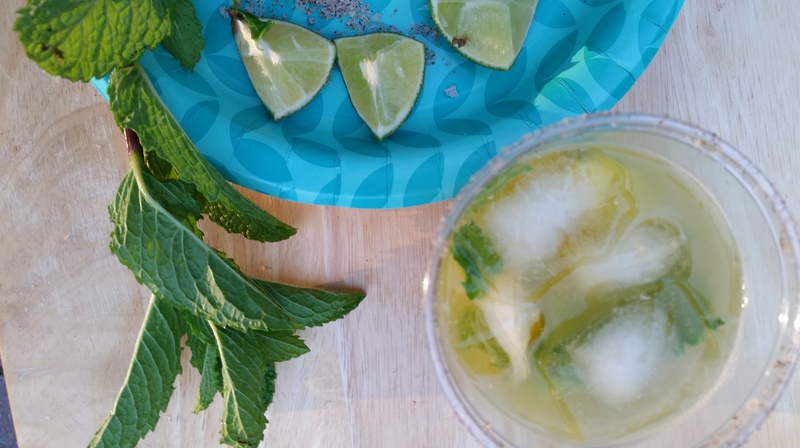 Add two or three lime quarters, three leaves mint and muddle thoroughly so you have lime juice in the glass. Add ice, pour the mango mix in and top with a bit of club soda or seltzer. Summer evenings in the neighborhood can be wonderful. Occasionally on a Friday some of us neighbors bring out folding chairs and sit together in one front yard for a bit of happy hour while the kids go mental on someone else’s lawn. It’s pretty much BYO, but we do mix up a pitcher of experimental cocktails sometimes. Or at least I do. 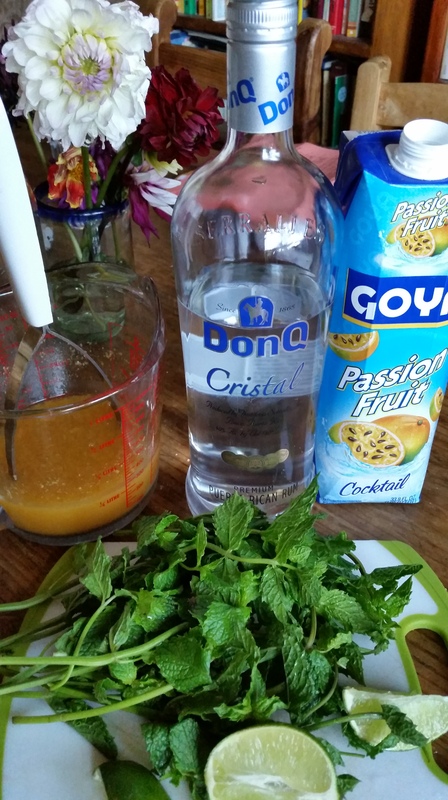 These Passionfruit Mojitos (which I call “Monrojitos” after our street) were very pretty and tasty. I brought over a cooler with the rum mix, lime wedges, mint and ice, and we muddled each drink individually, which made it festive, somehow. Individuals can adjust lime if they want it a bit more tart. Mix rum, juice and syrup in a pitcher or bottle you can close tightly and keep chilled. When you are ready to serve, place mint and lime in each glass and muddle (squeeze and press so tha the juices come out). Add ice, pour desired amount of rum mixture and top with a bit of club soda. We spent the better part of last summer in Puerto Rico, and among the tasty things that my little guy fell in love with was tembleque, a jiggly (temblar means to tremble) dessert that falls somewhere between pudding and flan. I promised him we’d make it back in New York, and this weekend, for a dinner with some dear Nassau Community College colleagues with whom I serve on the Latin American Studies Committee, I delivered. Who knew it was so, so easy to make that my seven-year-old could do it almost completely on his own? All I had to do was pour the hot mixture into the mold. I adapted a recipe from Cocine a Gusto (University of Puerto Rico Press), which is one of my go-tos for traditional Puerto Rican recipes. 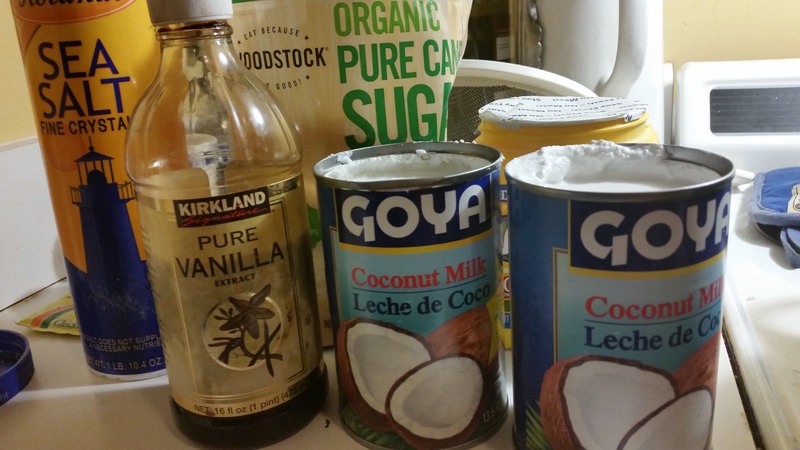 In future we will make it with homemade coconut milk (all you have to do is pour hot water over coconut flakes and strain, but more on that next time), but in the interests of expediency (I also made pollo guisado, black beans and pink beans from scratch, and yuca salad, so I had my hands full) I just used canned. Next time you want a fun dessert that takes your tastebuds to the tropics, tembleque is the ticket! Place coconut milk, corn starch, sugar and salt in a heavy bottomed saucepan and bring to a boil at medium high, stirring constantly until mixture begins to thicken. Add vanilla, stir and pour the mix into a slightly moistened mold (a smooth pie tin for one, or six ramekins for individual servings). Chill for at least three hours or at most 48. 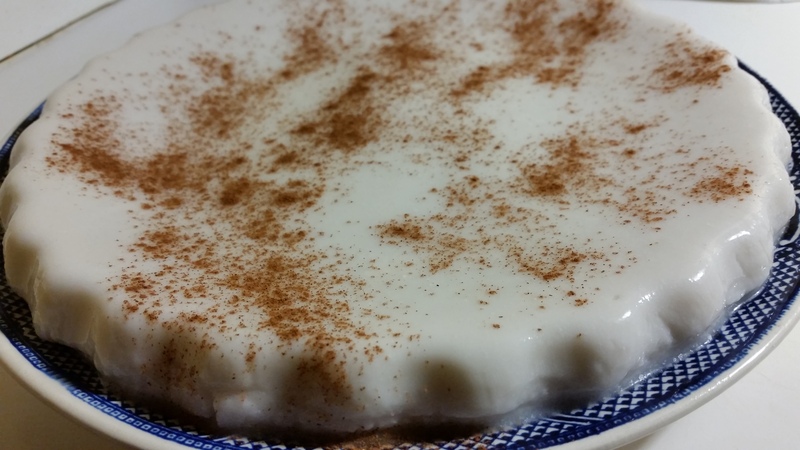 Turn tembleque out of mold(s), sprinkle with cinnamon and serve. We are a fútbol-loving family ( fútbol = soccer in the U.S. and football in most other English-speaking countries except the U.S. where football — rather inexplicably – means gridiron a.k.a. that sport with the helmets and shoulderpads. There’s also Australian rules football, which is actually a form of rugby, but never mind that right now). We particularly follow the English Premier League and support Chelsea, in case you were wondering. We watch it a lot at home, but watching soccer in the U.S. has ceased to mean spectator-in-exile. Increasingly in America you can find people with whom to watch. So that creates opportunities to invite folks to brunch or lunch (EPL matches are played at GMT and so rarely go later than 5 p.m. here in NY) with fellow travelers at home. Buffet-style is best, because the footie runs continuously for two 45-minute halves and if — like me — you are the hostess but really want to watch the action too, you want to get everything done before kick-off and then sit right down with the guests for the first half. Yes, we used white bread. And it was good. So, we invited friends for the 9 a.m. Southampton v. Chelsea fixture this past weekend. In addition to bagels and cream cheese, tortilla española, gravlax, ham and cheese, and mango-prosecco mimosas, my little guy made French toast. 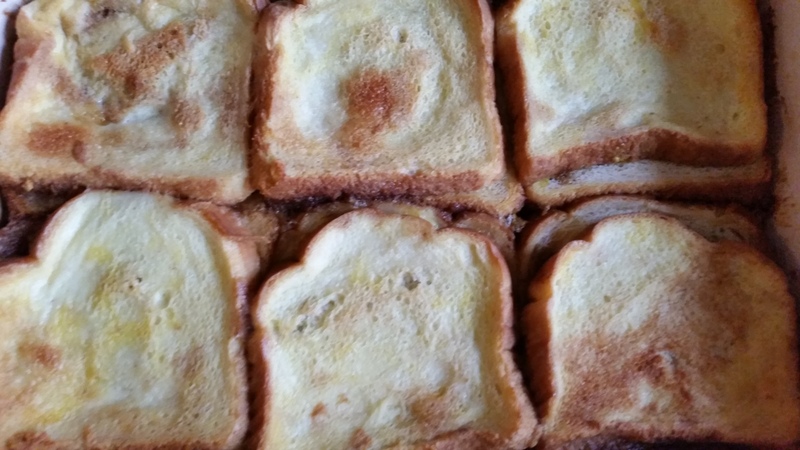 Since it would have been insane to try to make French toast to order at game time, we chose a recipe he could do the night before and pop in the oven for 40 minutes before everyone arrived. 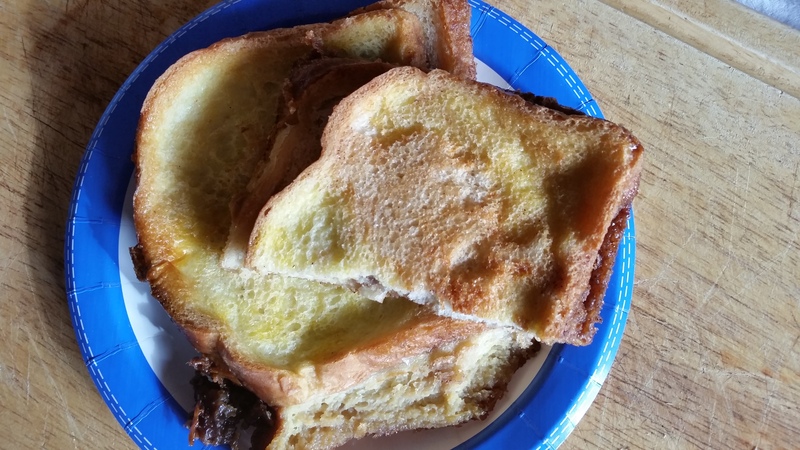 Thus this French Toast Casserole recipe we adapted ever so slightly from Love, Pasta, and a Tool Belt. 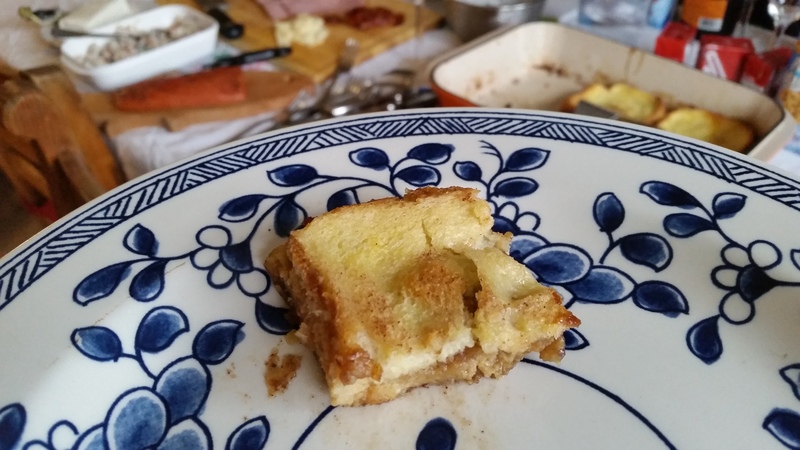 It was super-easy, sweet and delicious and has a bread pudding sort of texture and was loved by one and all. Firm, bread pudding type texture meant the kids could pick it up like a sandwich! To do it with kids, make sure you have the ingredients, measuring implements, and other equipment at the ready before you get the kids going. It is a breeze! Melt butter and mix with brown sugar and cinnamon until well-blended. Spread half of the brown sugar mixture on the bottom of a 9×13 rimmed baking pan. Lay six pieces of bread over the sugar mixture. Spread the remainder of the brown sugar mixture over the bread trying to make it pretty even. We used a butter knife to spread, but a stiff spatula would also work. Place remaining six pieces of bread on top. Beat eggs and milk together and pour over the whole thing evenly. If, like us, you forget to put on the second layer of bread, you can lift the already covered slices one by one and slide the unsoaked slices underneath and it will work out just fine. Cover and refrigerate overnight. Heat oven to 350°F and bake uncovered for 40 minutes. Allow to rest and then serve up! My sister-in-law Annika was born and raised in Sweden and in the 20 or so years since she appeared in our lives, (cue ABBA’s Greatest Hits) she has introduced us to such marvels as aquavit (also called snaps), lingonberry, ginger cookies, and (stop ABBA soundtrack and start spare, percussive track suitable for forbiddingly cold and spare winter landscapes and mythic creatures) the Volvo commercial featuring footballing demi-god Zlatan Ibrahimović. Mmmm. 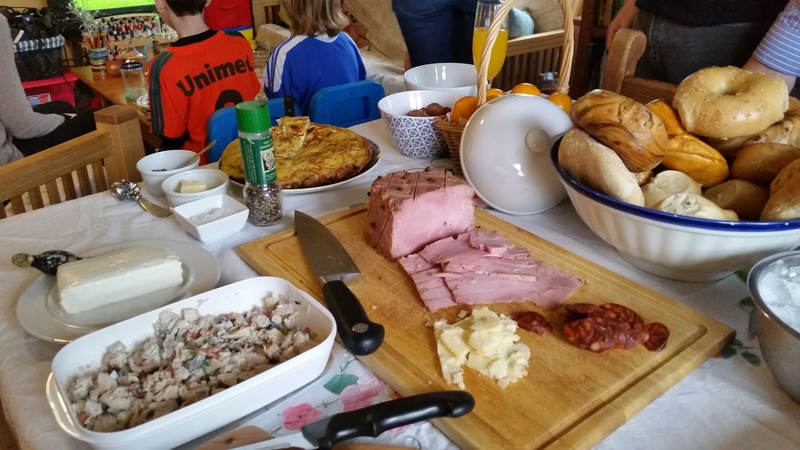 Thanks to Annika, we like to do a Swedish Christmas Eve buffet table. Or we like to have her do a Swedish Christmas Eve smorgasbord to which we contribute a couple of things. Unfortunately she and my brother and my marvellous niece don’t live close enough to us anymore for Swedish Christmas Eve all together, but thanks to IKEA, my dad’s gravlax (salt and sugar-cured salmon) and Annika’s easy potato gratin recipe, (The dish is called Jansson’s temptation) we were able to do a reasonable facsimile this year. Emboldened by the success of this dish, I think I will try her Swedish meatball recipe next year! Happily, we had leftovers for midnight snacking! Important note: The Swedish call sprats (a small fish/herring) by the name ‘anjovis’. DO NOT BE FOOLED. They are not the same ‘anchovies’ as you buy in the tinned fish section of your local supermarket (unless your local supermarket happens to be IKEA). They are not oil or salt-packed Italian anchovies with a strong salty fish character. These are pickled in spiced vinegar and are light and completely different. So beware! Willy’s online seems to sell them, although a recent check showed them to be sold out! i-Gourmet has them too. I will be trying out tinned “bristlings” which might be the same and I will let you know. 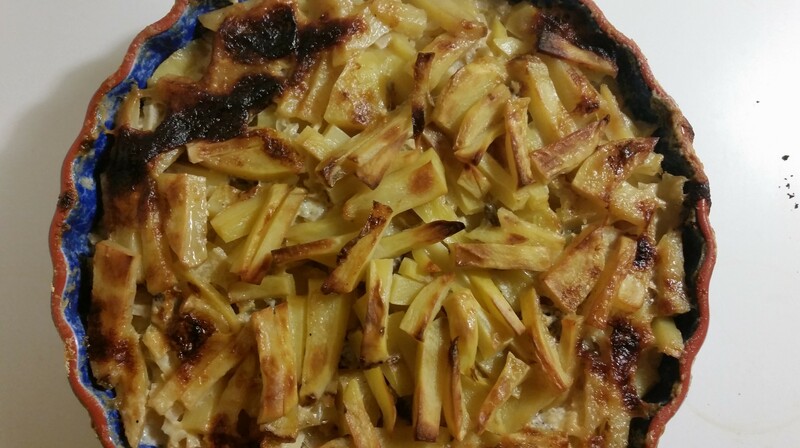 Butter an 8×8 dish and spread about a third of the potatoes over the base. Cover with about half of the onion, and place half the ‘ansjovis’ fillets on top (save the liquid that the ‘anjovis’ are in!). Cover with another third of potatoes, then the rest of the onion, and the rest of the ‘anjovis’. Finish with a last layer of potatoes. Pour the liquid from the ‘anjovis’ tin over the potato mixture. Pour the cream over the potatoes – you may need a bit more or a bit less – it depends on the size of the dish you’re using. You want the cream to almost cover the potatoes. Bake in a 425°oven for about 1 hour. 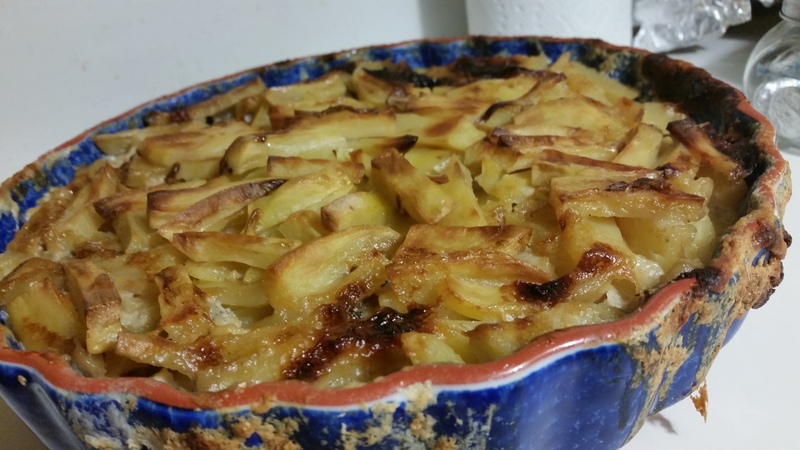 It’s ready when the potatoes are soft and the top layer is getting golden. 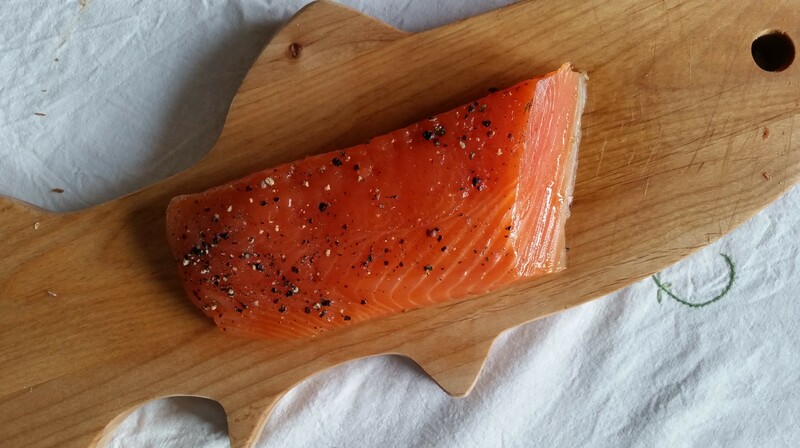 This years gravlax is phenomenal. EXCELLENT for entertaining as you can divide into pieces for each event. I was recently invited to do a cooking demonstration at Nassau Community College (where my more usual role is as a full-time ESL lecturer in a language immersion program) for the Mom’s Club, a campus club for student-parents where they get support in their struggle to complete their college education while raising children and often simultaneously holding a full-time job! 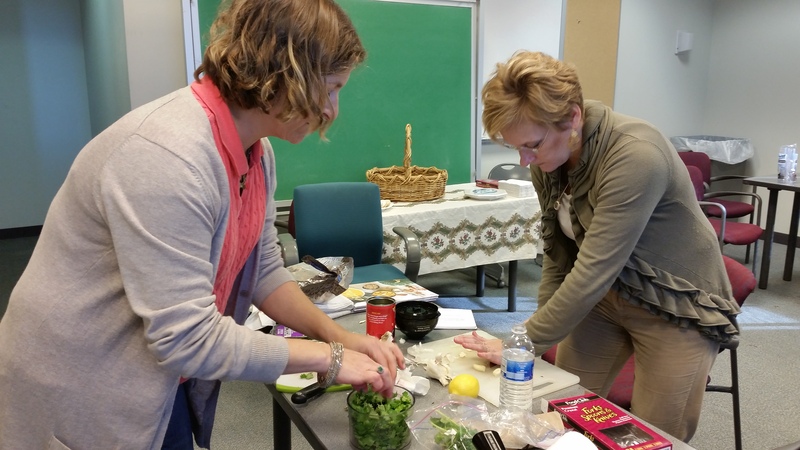 So these are women who needed a fun mini-workshop that would include some nifty snacks, some honest conversation and maybe even a few ideas for inexpensive and easy appetizers they can easily prepare for their families. I think this line-up delivered. 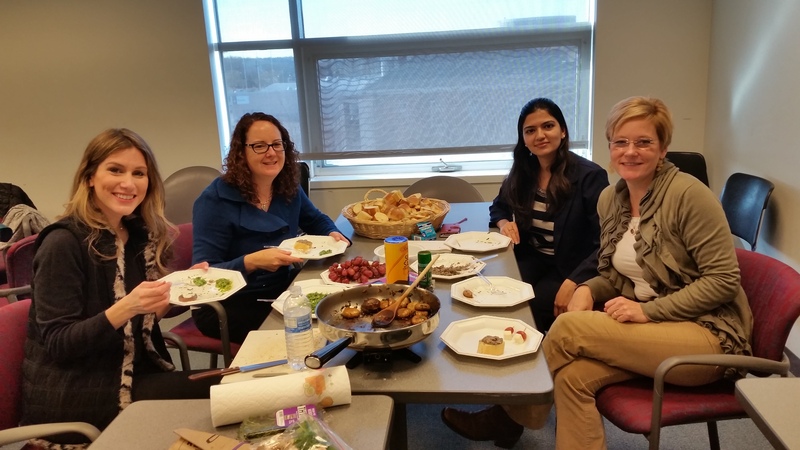 It was a pleasure to cook for this small group — thanks to professors Beth Goering and Molly Phelps Ludmar for inviting me and also providing an electric skillet, bread and soft drinks. Together — I put everyone to work, of course — we made Spanish-style garlic mushrooms, cilantro-sunflower seed pesto, black olive and walnut paste, and white cheese and red grape skewers. Everything was done within a half hour, so we had time to sit and eat, which is a rare treat for busy moms! Not my best images ever, but you get the idea! Cut Latin style white cheese into cubes about the size of the grapes. Skewer a single grape and a single cube of cheese onto each toothpick (this is a job kids love! and it keeps them busy while you are trying to do other things.) and arrange on a serving platter. The cubed cheese is the base. Place cilantro, garlic, sunflower seeds, lemon, and optional pepper flakes in a food processor or blender and whirr until chopped. Add olive oil bit by bit (in a thin stream if you can pour while blending) until you achieve a thick paste. Add cheese to taste (start with about 1/4 Cup) and serve over pasta or as a spread for bruschetta, crackers or sliced bread. For an easy basil pesto (my second grader makes it!) click here. Place all ingredients (except optional olive oil) in a food processor and blend till smooth, adding olive oil as necessary. 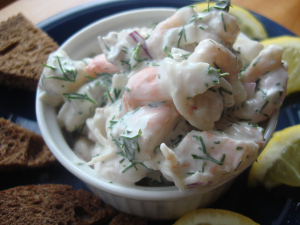 Serve as a spread for toast or crackers. For another version heavier on the anchovies, click here. 12 oz white or Cremini mushrooms, stems removed (and saved in the freezer for stock) and wiped clean with paper towel. In a large pan, heat the oil until loose and fragrant. Lower heat to medium low garlic and cook gently until golden brown. Add mushrooms and stir to coat., Allow to cook, stirring occasionally, until mushrooms start to brown deeply and release their juices. Add wine and raise hand eat to a fast simmer for about 5 minutes, until alcohol has cooked off but there is still liquid. Sprinkle with parsley salt and serve with crusty bread. 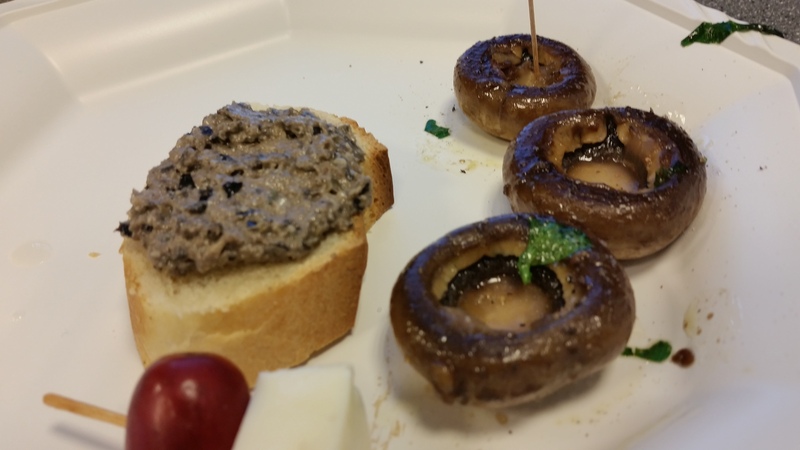 For a more complex version of these mushrooms that includes butter, click here. It’s been a long time since I stuffed a pumpkin, but Halloween and late fall combined to make me want to do it again. This is so easy and you can stuff any old winter squash with any old stew (or stuffing) and make a dramatic dish! In a large soup pot, heat olive oil until fragrant at medium high. Add onion, stir to coat, then lower heat and cook for about five minutes, until well-softened. Add garlic and cook for another minute. Add carrots and celery and cook another five minutes, until softening. Add ground beef and brown. Sprinkle with abundant Adobo powder, then add sweet potato, Worcestershire sauce, soy sauce and tomato paste. Preheat oven to 350°F while allowing meat mixture to simmer for at least 20 minutes on low, adding, adding oregano about five minutes before you take it off the heat. Sprinkle the inside of the pumpkin very generously with salt and pepper. 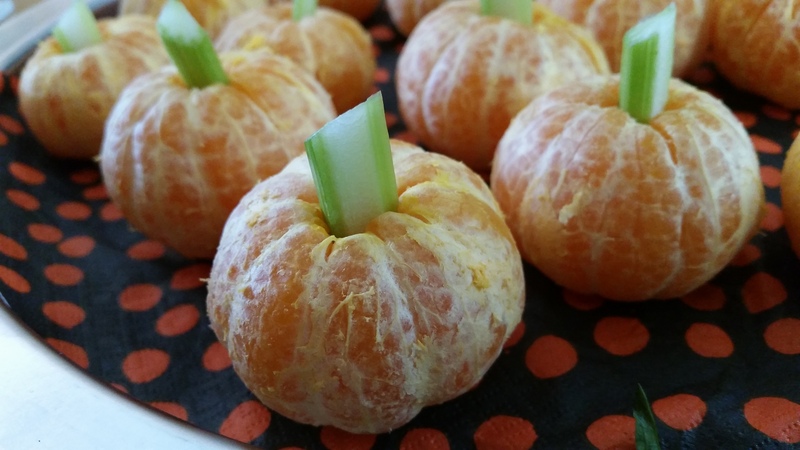 Put each pumpkin on a stable rimmed baking sheet with a bit of olive oil to prevent sticking. You’ll want something that you can carry the pumpkin to the table on, as the shell will soften and fall apart if you try to move it. 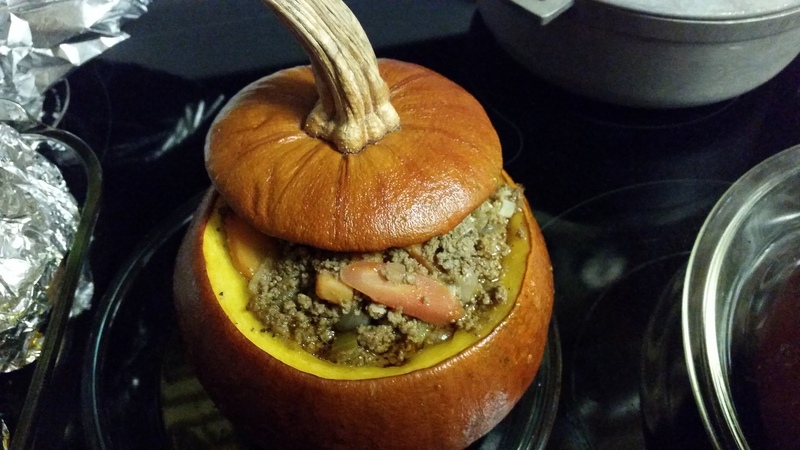 Stuff the pumpkin with the meat. 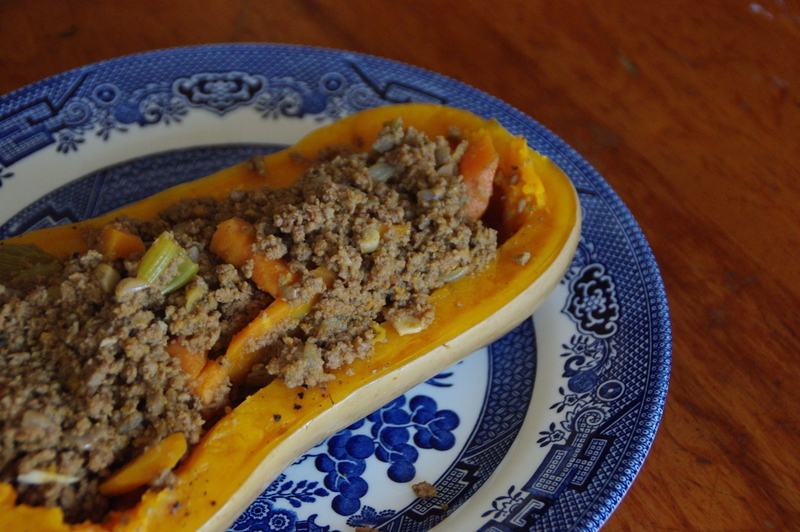 You can freeze leftover meat, or, as we did, quickly open up a couple of butternut squash, season and stuff also. Bake the pumpkins for an hour and check for tenderness. We cooked our two small ones for two and the squashes for about 1.5 hours. Allow to cool for a bit and bring to the table with the lids on for extra drama. As you scoop out the meat (it’s nice with rice), also scrape out some pumpkin, which should be seasoned and tender. We love Halloween around here and like to do a glorified Halloween playdate for the little man and his friends. 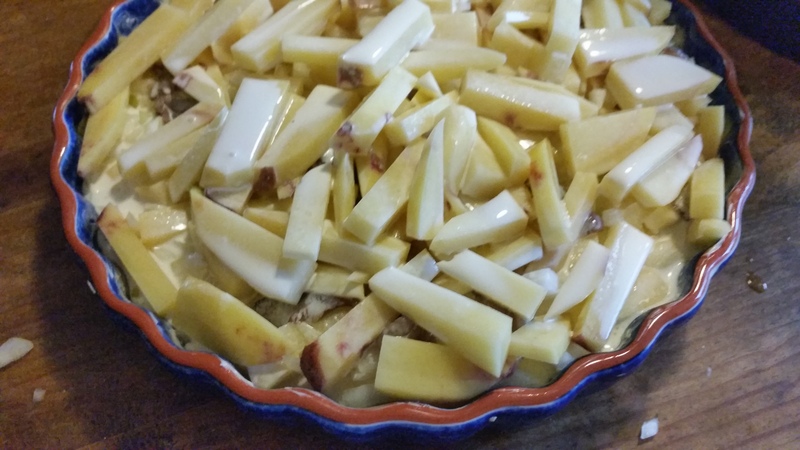 This post comes at a time when I am really pressed between my teaching, my son’s many activities, and just trying to keep the house on this side of utter chaos, so it will be quick and easy, just like these recipes. Set a saucepan of apple cider to low or medium low until warm. Ladle into mugs, sprinkle with cinnamon and use cinnamon sticks (medium length) as stirrers. Nice with a splash of cranberry juice too. 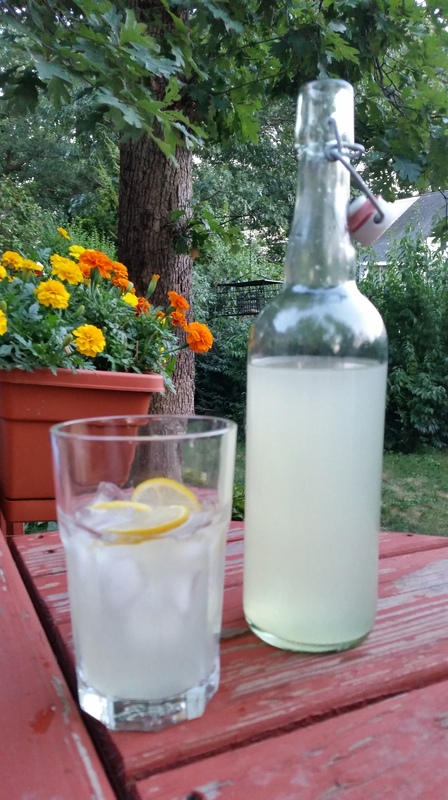 A refreshing, not-too-sweet, low-alcohol fizzy cocktail! In a champagne flute pour one part prosecco to one part apple cider. Top with cinnamon. Thanks for this one, Tina Christiansen! 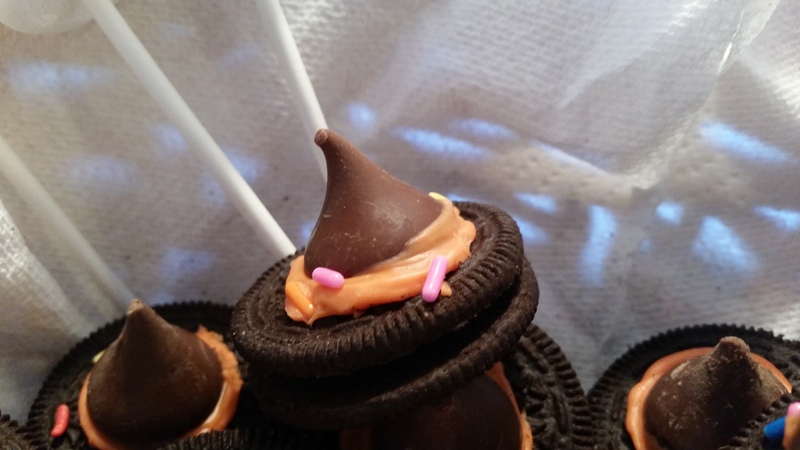 Take Oreo cookies and top with a Hershey’s Kiss. You can use frosting to make them stick. Spread thinly cut white bread with Nutella (add raspberries if you like). 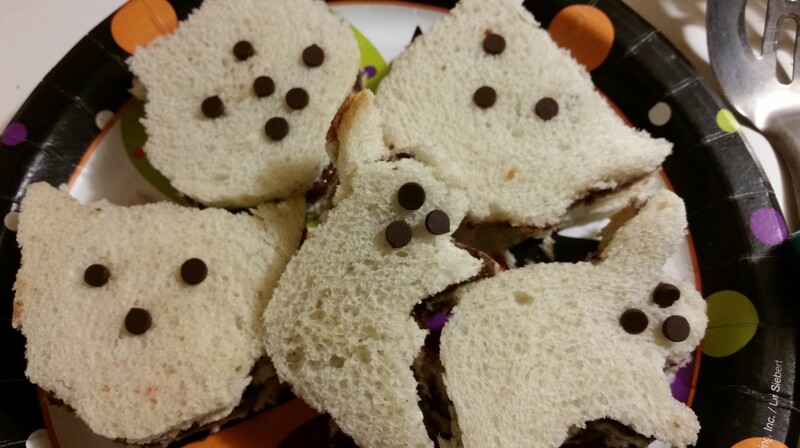 Top with another slice of white bread and for extra fun, use a Halloween themed cookie cutter to cut them into shapes. then use tiny chocolate chips for eyes,noses and mouths. Try not to eat all the cut off bits smeared with Nutella. The Pillsbury photos show a much tidier assembly, but my mess worked just fine and the kids thought they were cool! Be prepared with 10 hot dogs and dry them off as best you can. Moisture gums up the works a bit. Into the oven you go, my pretties! 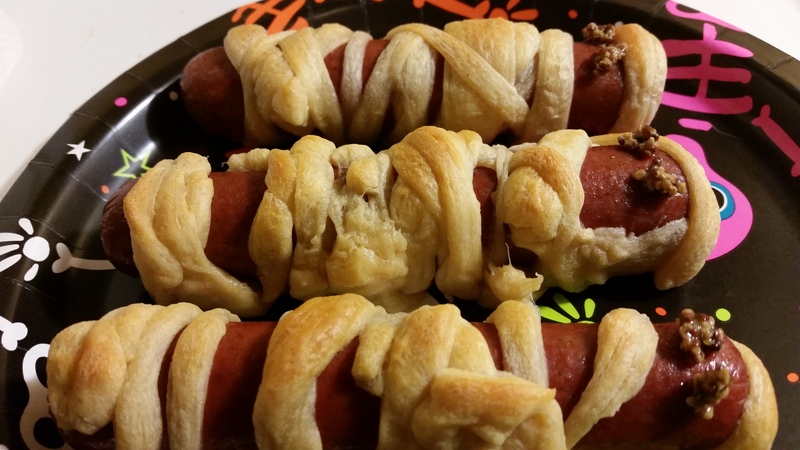 Take one tube of Pillsbury Crescent Dough and roll it out, pressing the perforations together. Take a pizza slicer and slice into thin strips (1/8 – 1/4″). 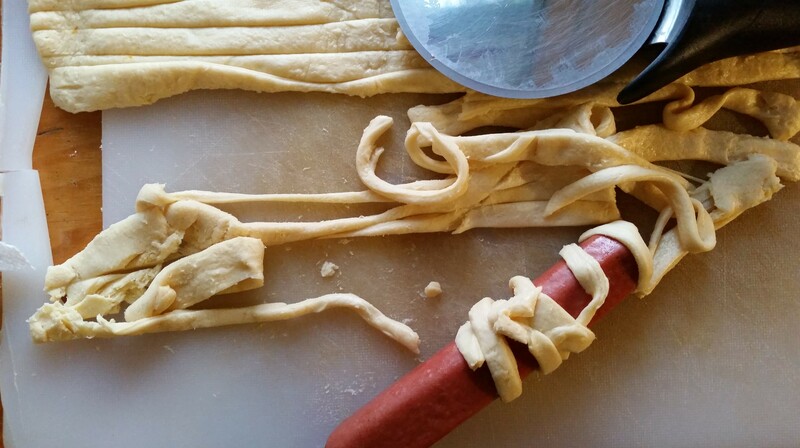 Working quickly, wrap 3-4 strips around each hot dog, leaving space for eyes. 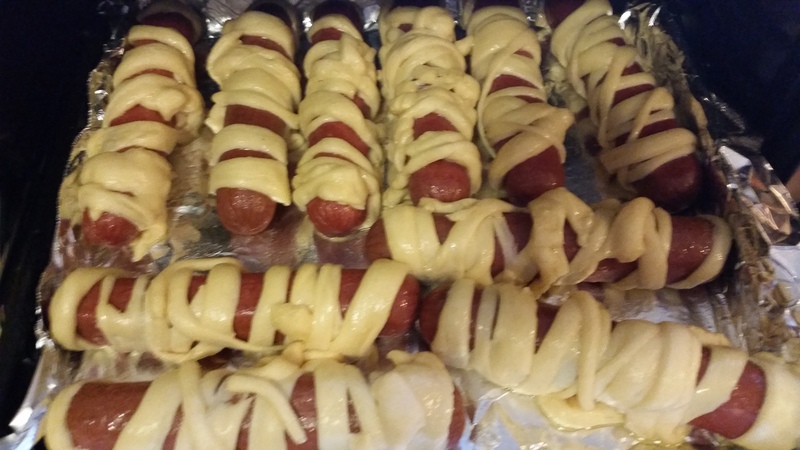 Place them on an ungreased baking sheet and spray the tops with a bit of cooking spray. Bake for 13-17 minutes until pastry is golden brown. Dot mustard or ketchup for the eyes and serve. What I made for the grown-ups…more on this later! 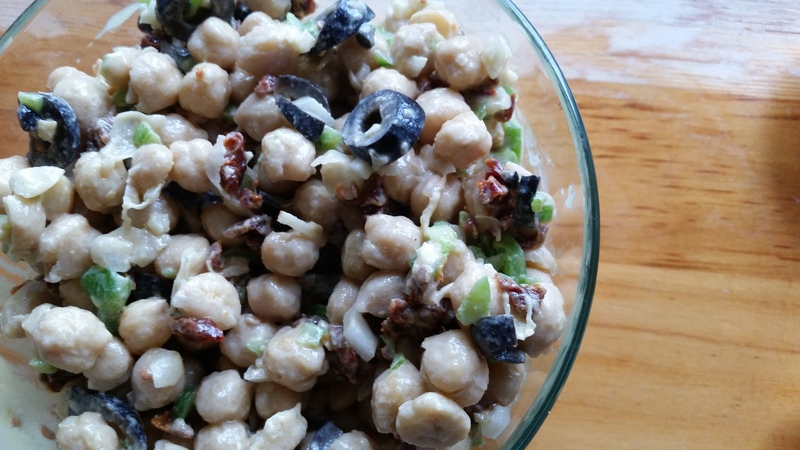 I love garbanzos (chick peas, ceci) in all different ways, but especially as a salad or salad topper. They add meatiness and texture to everything and taste great with loads of garlic and onions. 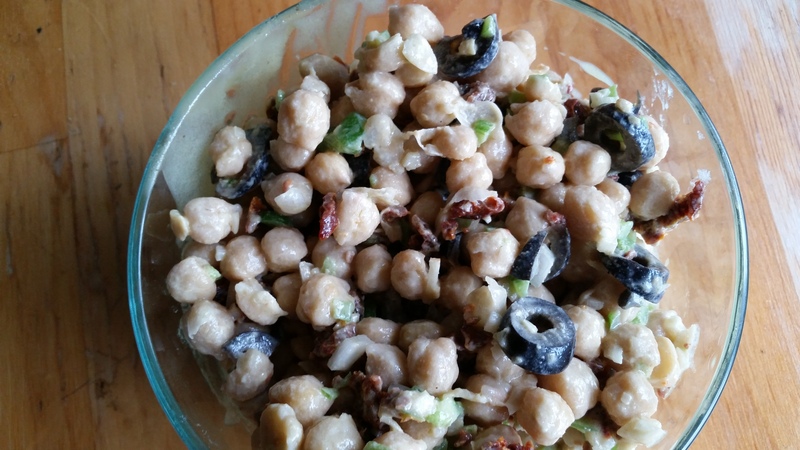 Here is a quick and easy salad that uses up the bits and bobs you have in your fridge. When I make this kind of salad, I feel as though I am just giving it everything I’ve got; you’ll notice that the quantities of each ingredient can vary to your taste and availability. We’ll be having this one tonight with cold leftover chicken, perhaps some marinated artichoke hearts, an olive assortment, some pistachios and clementines. Delicious light dinner! In a serving bowl, whisk the olive oil, vinegar, and lemon juice, until smooth. 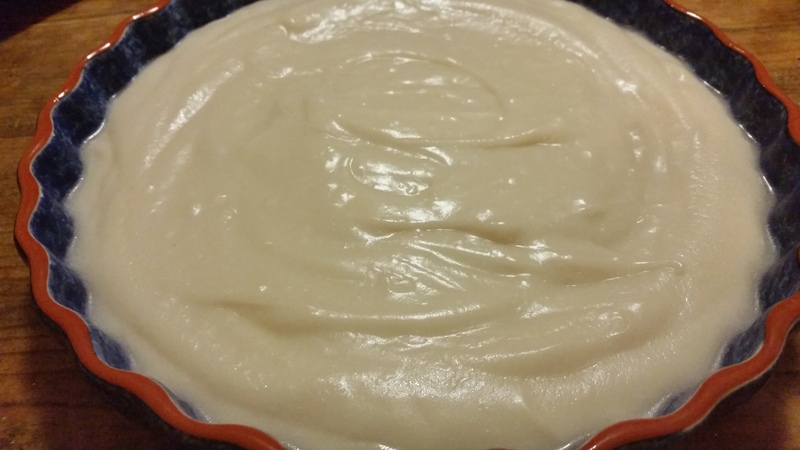 Stir in tahini until smooth, then a bit of salt. Add remaining ingredients and mix well, adding additional salt if desired. Serve over salad greens or rice.